In New York this week, and I popped in to see my good friend Steven Taffel, founder of Leffot – far and away the best shoe store in the city. In fact probably anywhere in the US outside Hawaii (the competition there being Leather Soul). Since Steven and I first met, it’s been interesting to see the growth of both our blogs. While they have very different natures (Steven’s being a commercial venture to create interest in the store), the aim of celebrating classic men’s shoes is the same. And I still find it astonishing that we are unique, two years down the road. There are so few good men’s style blogs outside the US, and so few good commercial blogs by shoe retailers anywhere. 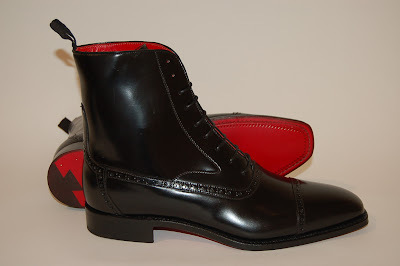 In fact I always say that if I want to browse high-end shoes, the Leffot blog is the first place I go. There will always be more images of shoes from Aubercy, Corthay or Edward Green there than on the companies’ own sites. One definite trend over the past two years has been the popularity of locally made products in the US, and how that has benefited American shoemakers. 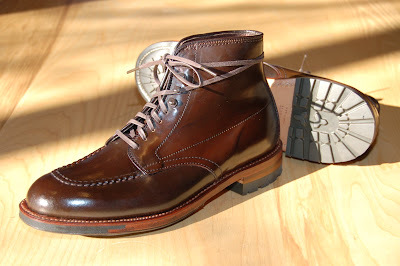 Leffot now carries Alden, Rider Boot, Sebago and Wolverine, and the US brands have become the most popular in the store. The Wolverine 1,000 mile shoe is incredibly popular and the first two shipments of the Exclusive JC Indy Boots (below) from Alden sold out before they could reach the store. The Wolverine isn’t exactly my style and I’ve never been a big fan of untextured brown cordovan, as the Indy Boots are made from; personally I’d go for the Rider Boot shown below – a made-to-order version in black with a red lining and sole. But you can’t argue with the sales figures. The Indy Boot is an example of another trend too – of Leffot growing from a simple retailer to a creator of its own products. Long a popular route for made-to-order shoes from Rider, Gaziano & Girling and the like, the Exclusive JC Indy was a special commission for the store named after a customer, Mr JC. 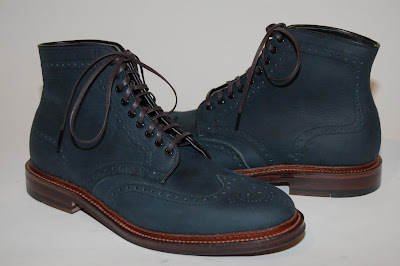 The blue Greenwich boot from Alden with ‘water lock’ waxed soles (below) was also an exclusive. In the future, look out for Leffot commissioning its own exclusive designs, working with some US shoemakers and hopefully going on sale later this year. You can follow the discussion on Leffot: A sign of US shoe trends by entering your email address in the box below. You will then receive an email every time a new comment is added. These will also contain a link to a page where you can stop the alerts, and remove all of your related data from the site. I hate to have to say it, but those Corthays at the top are hideous. 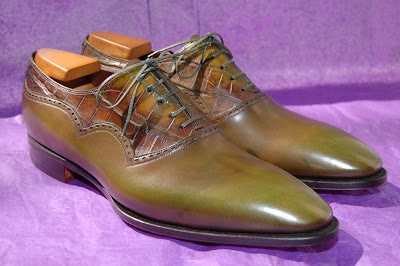 On the other hand, both of the Alden boots are very appealing. The jury’s still out on the Rider boot. I just purchased a pair of Alden Indy’s here in Honolulu from a nice guy, Matthew from Leather Soul. So far, so good:-) I also have a pair of 1908 Centennial Red Wings. I’m glad I have both. Interested in your comment above about untextured brown cordovan – what do you see as its disadvantage? Thanks Simon. Yeah, that’s a noble shade. I don’t own any yet but I like the idea of fine shoes that don’t make you feel guilty in bad weather.